Serpent's Bluff Redoubt is a small Forsworn camp and ruin south of Rorikstead (west of Whiterun). The redoubt is situated atop a steep incline leading southwest from Rorikstead. The redoubt has an exterior and one interior zone: Serpent's Bluff Ruins. 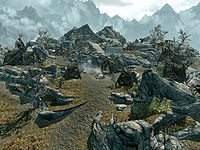 The campsite is solely inhabited by Forsworn, while their hagraven matriarch resides within the ruins with several more Forsworn allies. Bounty: Forsworn: Kill a Forsworn leader for a bounty reward. The Ghost of Old Hroldan: Put an ancient ghost to rest. Kill the Forsworn Leader: Do a favor for Jarl Igmund by killing a Forsworn leader. Lisbet's Missing Shipment: Retrieve a missing Dibella Statue for a struggling store. The campsite is home to numerous Forsworn, including a Forsworn Briarheart. The lower part of the camp has three tents containing bed rolls around a campfire in the middle. The first tent also contains an end table with a bunch of frost mirriam on top. The third contains a small unit with a bottle of alto wine, one of wine and a random potion of healing on the shelves. To the right are two more tents, with a forge and tanning rack between them. One tent contains an apprentice locked chest with a knapsack propped up against it along with a bed roll and table. The other tent has a table with two random two-handed weapons and a random heavy helmet. To the left is a bookcase holding two common books including a copy of The Legend of Red Eagle and a small coin purse. Beside this is a workbench. Proceeding further uphill are two more tents separated by a pair of long wooden tables and benches. On the tables is an iron war axe and an iron dagger stabbed into a tactical map of Skyrim at Markarth. The tent to the left is where the Briarheart sleeps and contains a boss-level chest at the foot of a double bed with a set of shelves beside it holding a leg of goat roast, a potato, a deer hide and a random potion of healing. On either side of the entrance is a dresser and small unit. The dresser has an iron helmet and random enchanted battleaxe on top, while the unit holds a sliced goat cheese and a medium coin purse. The second contains only a bed roll and a wooden bench, with a flight of stairs to the right that leads to the entrance to Serpent's Bluff Ruins. West of the camp, near a ruined tower, is a chest. There are six enemies (including a hagraven boss) and many traps inside this small area. The entrance leads to a well lit passage that turns to the northeast and descends a flight of stairs. At the bottom is a corridor with a wooden table on the left with a copy of The "Madmen" of the Reach, a random bow and arrows and leveled potion of resist shock. There is a pressure plate on the floor that is easily spotted that triggers a poison dart trap. The corridor continues to the southeast with barred openings on the left that enable you to see into the main chamber ahead. There is a tripwire part way along this passage that triggers a spear trap from the side wall. To the right of the door at the end of the passage is a Forsworn sitting in a chair with a common book at their feet. On your right, just after the tripwire, is a dresser partially buried in rubble containing clothes with a steel sword on top. Past this is a second pressure plate that triggers a spike wall. To the right of the door is a large fireplace with a steel mace on the ground in front of it. The door is unlocked and leads into another narrow passage with stairs leading down. At the bottom there is yet another pressure plate; this one triggers a battering ram ahead. At the end of the passage, you will find a dresser that is covered in blood with an iron dagger on top. To the right is a caved-in section with a random shield among the rubble. To the left is a doorway into the main chamber seen from above. The main chamber contains two Forsworn and a hagraven. Both the hagraven and one of the Forsworn are on a raised section to the north while the other Forsworn is wandering the lower level. In the middle of the lower level is a large stone table with a weight sensitive plate and items of clutter. You will need to activate the plate by dropping an item onto it as the door only remains open as long as the plate is activated; one of the otherwise useless items on the table can be used for this. In the eastern corner there is an adept locked door to a room under the upper level. The room contains a cupboard with a large coin purse and three common books on the shelves, a steel warhammer on the floor, a set of shelves that are partially buried in rubble holding a set of random armor, a small coin purse and two common books. Finally, at the rear of the room is an apprentice locked chest containing minor loot. Climbing the stairs, at the top is a barrel containing ingredients and a plinth with a copy of the spell tome Frostbite. Once you are past the wooden gate, there is a T-junction with a table opposite with a random potion or poison on top. To the right is an open door with a barrel of ingredients to the right and inside the room there is a random greatsword on the floor by the southeast wall. To the left is a pile of straw with five hagraven feathers among it. In the eastern corner, in front of the head of an elk with mammoth tusks wrapped around it, is an unlocked boss leveled chest. To the left is a cupboard with three common books, a bowl of bone meal, two pieces of canis root, a nightshade flower, two random potions of magicka and an empty random soul gem on the shelves. Against the northwest wall is an arcane enchanter with a copy of the Enchanting skill book Twin Secrets on top. Next to this is a wooden table with a charred skeever hide, a wooden bowl containing two slaughterfish eggs and two empty random soul gems on top. Back in the passage there is a rack hanging from the ceiling holding two bunches of dried elves ear and a garlic braid. Taking the left fork at the T-junction there is a pair of random boots on the floor near the top of a flight of stairs leading down. At the bottom is another wooden gate with a button on the right that lowers it. Beyond is a natural tunnel containing four white cap, three blisterwort and two fly amanita fungi; this tunnel leads to the exit which is located southwest of the entrance. To open the gate you need to activate the plate. While looking at an item, press and hold down the action button. Instead of looting the item, this will allow you to easily drag it on top of the pressure plate. You can walk on the plate and then use Slow Time dragon shout to go past the door. An iron ore vein can be found north-northwest of camp, right next to the rock underneath the camp fortifications. This is the only Forsworn camp not located in The Reach. This page was last modified on 20 April 2019, at 19:45.